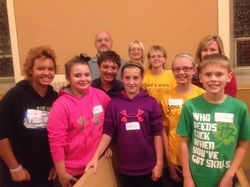 Members of our Confirmation class and some parents went to a Meet Bishop Prois event at Grace Lutheran Church in Fort Dodge on September 25. Back row: L-R Bernie Kofron, Kiley Sorensen, Val Danner, and Diane Hagen. Front row: Anisah, Kena, Brennon, Rylee, Megan, and Jack.